i always HAD to have black bean spare ribs whenever i went to dim sum (in my pre-vegetarian times, of course), yet it’s taken me years to actually start cooking with fermented black beans at home. 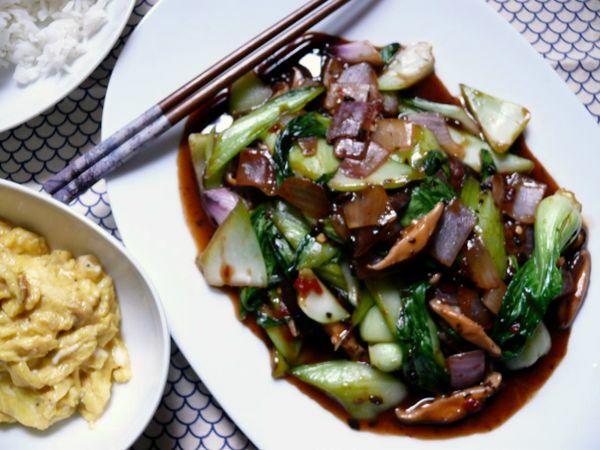 the flavour is so much truer than what you get from bottled black bean sauce, both stronger and uncluttered by all of the other seasonings in the pre-made sauce. over the past couple of months, i’ve been using black beans in my stir-fries and i’ve finally been able to recreate the flavour that i remember so well from dim sum. the next step is to recreate my favourite black bean fried rice noodles at home, this time without resorting to a bottle. hopefully i’ll be sharing that recipe with you in the near future. for now i’m still playing around and throwing those little black beans into the pan whenever possible. this is a dinner that came together so quickly last week, that i made it between coming home from work and rushing out again to meet friends on the other side of the city by 7.30. veggies into the hot wok briefly, then 3 or 4 sauce ingredients, including chopped, fermented black beans mixed in a bowl and cooked with the fried veggies for 3-4 minutes. to make the meal more substantial, i scrambled some eggs splashed with sesame oil in the same wok. the (white) rice took more time to make than the rest of the meal so i was happy. until i ran for the subway with a really full stomach. tip: never do that.